Employees often incur Travel and expenses (T&E) during the course of their employment. Employers can reimburse such expenses on a tax-free basis. However, the reimbursements can become fully taxable if the Employer's T&E Policy is not IRS compliant or if the employees fail to adequately substantiate their business expenses. These standards are popularly known as an accountable plan. This article provides IRS compliance tips for accountable plans, and the common schemes to help you detect and prevent T&E fraud. An effective Travel and Expense Policy Development and automation can go a long way in managing cost savings and boosting employee well-being and job satisfaction. The IRS standards require firms to obtain full accounting for the business expenses incurred by the employees such as receipts and expense report within a reasonable time period. Similarly, unused advances or excess reimbursements must be returned to the employer within a reasonable time period. Under a de minimis standard employees do not require to submit receipts for expenses that are less than $75. The expense must have a business connection. The expense must be directly related to the performance of services as an employee. The expense must be adequately substantiated or must be deemed as substantiated. Substantiation includes receipts, invoices that document the nature and amount of the expenditure. Deemed substantiation is the amount of the expenditure that is reimbursed by using the mileage allowance for operating a vehicle. Any reimbursement or allowance in excess of the accounted for should be returned within a reasonable time period. The return can be made on a periodic (within 60 days of travel) statement or on a predetermined date. (Quarterly if on perpetual travel status). Return unused advances or excess reimbursement within 120 days of receiving the expense or incurring the expense. The T&E policy should require the employees to make an adequate substantiation of expenses through documentary proof. These documents include receipts, invoices, canceled checks, and bills of their business expenses complemented by a clear detailed statement of expenses, diary, account book, or a record of where and when they incurred the expense. Such is commonly met by submitting an expense report. Despite meeting all the accountable plan standards, unreturned excess reimbursements and reimbursements of non-deductible expenses connected to your business are taxable. Why the meal was considered official business? Where did the meal occur? What was the cost of the meal? When did the meal occur? Fares for taxis or other types of transportation between the airport or train station and your hotel, the hotel and the work location, and from one customer to another, or from one place of business to another. Shipping of baggage, and sample or display material between your regular and temporary work locations. Using your car while at your business destination. You can deduct actual expenses or the standard mileage rate, as well as business-related tolls and parking fees. If you rent a car, you can deduct only the business-use portion for the expenses. 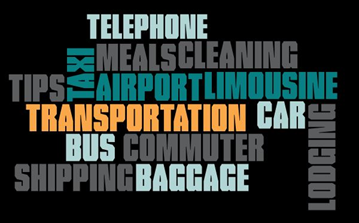 Tips you pay for services related to any of these expenses. With companies everywhere eyeing the bottom line, insistence on compliance with travel & entertainment policy is becoming more commonplace. What's more, the IRS has also been taking an equally harsh stance, so compliance must now not only be to the company policies but also IRS rules. Otherwise, you could end up answering not only to the CFO but also the IRS - and that is truly ugly. The 'Expense Reporting Best Practices' seminar takes a deep dive into the topic. The seminar will start with an intensive review of what the IRS requires of an expense reimbursement policy in order for your company to maintain an accountable plan. It will also identify other best practices every organization needs to use in order to have an effective policy. Data showing exactly what other companies are doing with regards to expense reimbursements will be shared. This course is approved by NASBA (National Association of State Boards of Accountancy). Seminar attendees are eligible for 10 CPE credits upon completion of this workshop. The speaker Mary S. Schaeffer, a nationally-recognized account payable expert, is the author of 18 business books, a monthly newsletter, and a free bi-weekly e-zine, as well as several CPE courses for CPAs. She runs AP Now, a boutique publishing and consulting firm focused on accounts payable issues. She also serves as the Education Director for the Institute of Financial Operations. Before turning to writing and consulting she worked in the corporate world as an Assistant Treasurer for the Equitable Life Assurance Society, a Financial Risk Manager for O&Y and a Corporate Cash Manager for Continental Grain. A frequent and popular speaker at both live and online events, she has an MBA in Finance and a BS in Mathematics.